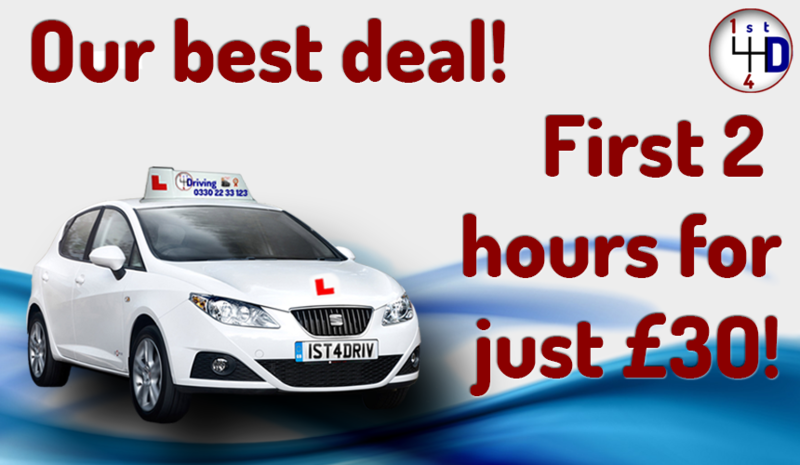 1st 4 Driving is Your Best Choice for Driving Lessons in Portsmouth. We offer results based driving lessons in Portsmouth you’ll love, GUARANTEED. This page will explain how our driving school in Portsmouth works. Pass first time. Every pupil receives the free guide ‘Passing your Driving Test First Time’ – written by Driving School Dave. All instructors use coaching methods. The new standards check by the DVSA ensures driving instructors use coaching methods to allow pupil-centred driving lessons in Portsmouth. That’s right, free and complete theory training when you buy driving lessons in Portsmouth. Not part-access like some schools, where you have to pay to access the full system. Manual and automatic driving lessons. We offer both manual and automatic driving lessons in selected areas. Reliable, patient and friendly driving instructors. Our driving instructors in Portsmouth will turn up on time, will not ever ‘shout’ and will make YOUR driving lessons fun. Email and text reminders of your driving lessons. You will be reminded about your lesson prior to it and you will also have access to some exclusive hints and tips on driving. Local driving school with local driving instructors in Portsmouth. All driving instructors in Portsmouth have been Disclosure and Barring Service (DBS) (formerly CRB) checked for your assurance. 55% of Learners Fail the Driving Test. Book Lessons Now To Find Out Why 98% Pass With Us! 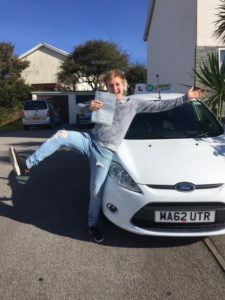 If would like to read about us in more detail, then here is the information on why YOU need to choose 1st 4 Driving as your driving school for driving lessons in Portsmouth. You need a driving school in Portsmouth that you can trust, and one that is backed by strong foundations and correct and proper teaching, which is not often found in most other driving schools. You need to know that the driving school you choose will get you through your driving test at a pace to suit you and not waste your valuable money and time. Driving lesson price can not necessarily guarantee all this. While it’s true that the most expensive is not necessarily the best, it’s probably true that the cheapest won’t be. Buying driving lessons in Portsmouth is a life skill and something that shouldn’t be chosen by picking the cheapest driving lessons around. Your driving instructor needs to be honest and needs get you to where you want to be in a time frame that suits you. What you want is the independence of driving on your own as soon as possible and as cheaply as possible. That’s where we come in. 1st 4 Driving was established in 2000 and incorporated in 2005, so you know we’re here to stay for you. We get you on the road to independence quicker with our proven systems. While not the cheapest initially, we will save you £££s in the long run by reducing the overall amount of lessons you take. Our high first-time pass rate ensures you don’t waste money on extra driving tests and driving lessons in Portsmouth. Nobody really wants driving lessons or driving tests, you want to be driving your own car independently. That’s what we can do for YOU! More choices from your Portsmouth driving school. 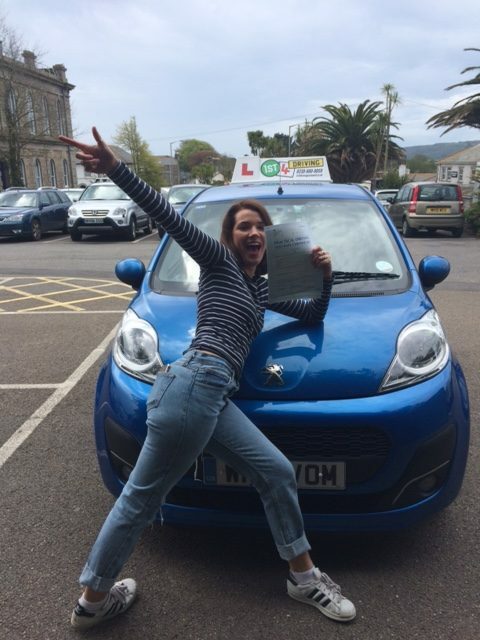 While we are specialists in getting you on the road to your independence as a learner driver, we offer many other types of driving lessons in Portsmouth. Anthony is our instructor trainer in Portsmouth and has currently never had anybody fail to become a driving instructor in Portsmouth who he has trained. We have male and female instructors in Portsmouth and can accommodate nervous drivers. We can also offer automatic driving lessons if you pop over to Southampton for lessons with Tony, our automatic driving lessons specialist. As well as this, we offer refresher driving lessons in Portsmouth. These lessons are ideal for people returning to driving or maybe need a little confidence boost. Alternatively, we can offer intensive courses for people who want to get on the road quicker. Holders of foreign or international driver’s licences are welcome too, and we can help you familiarise on the UK roads or help you obtain a full UK driver’s licence. Our owner Dave knows the answer to all licence situations and can advise on those difficult questions. We can also advise and train in the fleet corporate market and we are associated with the Driver Research and Education Foundation. We are your specialist driving school in Portsmouth to get you your independence quickly. Refresher driving lessons in Portsmouth available. Intensive courses in Portsmouth for those who want to learn quicker. Fleet corporate driver training and advice. UK familiarisation driving courses in Portsmouth. Advice from the country’s highest qualified driving school owner. My driving instructor was Tony and I would highly recommend him for anyone. From day one he was patient and understanding when it came to getting behind the wheel; he was not afraid to push me but always ensured I felt confident in my abilities. He was also very accommodating with arranging lessons around my college schedule. 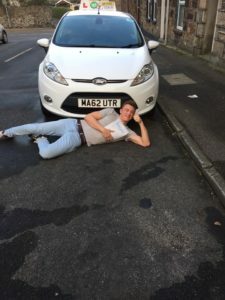 Tony has flexible teaching methods to suit the different needs of his pupils – if I failed to understand something he would use numerous verbal and visual explanations so that I never ended a lesson feeling confused when it came to the rules of the road. I absolutely love driving and have recently passed my test thanks to him. I couldn’t have asked for a better mentor. Thank you Tony!! We often do offers on our driving lessons in Portsmouth. We keep our prices competitive to be fair to both pupils and driving instructors. Discounts can be given for block bookings too. We recommend having 2 hour driving lessons, as this will help you save money in the long run and help you to pass your driving test quicker. They also prepare you better for your driving test, as on the day you will be driving for 2 hours (an hour before and then the driving test). A very good article was written on this subject by Driving School Dave. Follow this link to read it. How many driving lessons will you need? We also offer some all-inclusive packages. These packages can save a lot of money and make fantastic gifts. We can send presentation vouchers for these, and if they are a surprise, you can tell us at the time of booking and we will be very discreet. More information on offers etc. can be found by visiting our offers page. 2 hours for just £30. Prices can include driving tests. 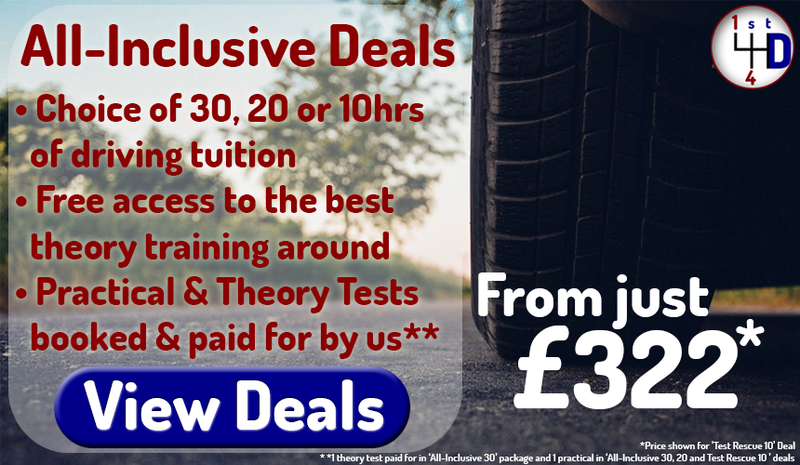 FREE theory training with ALL driving lessons. There are two Driving Test Centres in Portsmouth, one at James Callaghan Drive opposite Fort Southwick, PO17 6AR and the other at The Richard Sainsbury Building, Daedalus Argus Gate Daedalus Drive, Lee on the Solent, PO13 9JY. Portsmouth driving test routes can have a wide variety of different road types, where slower roads and faster roads lie side by side. Being a large city, you will need to be able to negotiate narrow streets in the city centre, dual carriageways like the A27, and motorways like the M25. Portsmouth has some very complex roundabouts, all within easy reach of the Driving Test Centres. Your professional driving instructor in Portsmouth will know all the places you can be tested, and this will be covered on your driving lessons in Portsmouth. A driving test in Portsmouth is designed to test your independence in a variety of road situations and whether you have reached your goal of independence on the road. There are no shortcuts to this. Many try but end up taking multiple driving tests, costing time, money and extra driving lessons. Driving examiners are very fair in Portsmouth and have set marking criteria. It is not objective, which means the examiner’s opinion is not relevant. If you make a driver fault, then this will be entered onto a marking sheet called a DL25.You will be allowed up to 15 of these on your test. However, a serious driver fault can be awarded if, for example there was another vehicle or person present. If the examiner or anyone else has to take some form of action, then this might be classed as a dangerous fault. You are allowed up to 15 driver faults. No serious or dangerous driver faults. We will book the driving test for you. We will ensure that the car and driving instructor are ready for your driving test. Your driving instructor will give you the option of coming with you on your driving test. You will get a driving test to suit your time frame and commitments. The examiner is a very nice person, honest! A – You will use the car you use for your driving lessons. A – All our cars are chosen for their popularity and ease of driving for your driving lessons. They will be clean and modern. Each of our driving instructors have their own preference, so if you have a car you are particularly interested in, ask at the time of booking your driving lessons in Portsmouth. Typical driving school cars are the Ford Fiesta, Vauxhall Corsa, Citroen C3 and the BMW Mini. Cars will have air con for those hot days and heating for those cold days. They are up to date and equipped with all the latest safety equipment. All our driving school cars are fitted with dual controls in the unlikely event that they’re needed, so you know you’ll be safe with your driving instructor in Portsmouth. Modern, clean, efficient cars to learn to drive in. Dual controls fitted for your safety. Air con for your comfort. Fully insured for driving lessons and driving tests. So, How Can I Book Driving Lessons in Portsmouth? We believe in making life simple and easy for you. We know everybody has their own preference, so we have many channels for you to book your driving lessons in Portsmouth. Call us on 0330 22 33 123. 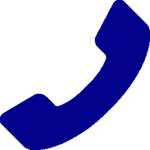 One of our experienced members of staff will answer and help you with your booking. They can help with any questions you might have, too. If you don’t get an answer, leave a message on how best to contact you and we’ll do that as soon as possible. Send us a text message to book your driving lessons or request a call back. An extremely popular way to book driving lessons is to use the little chat widget in the bottom left corner of the screen. Click here to start a Facebook conversation with us, where we can book you a driving lesson in Portsmouth.